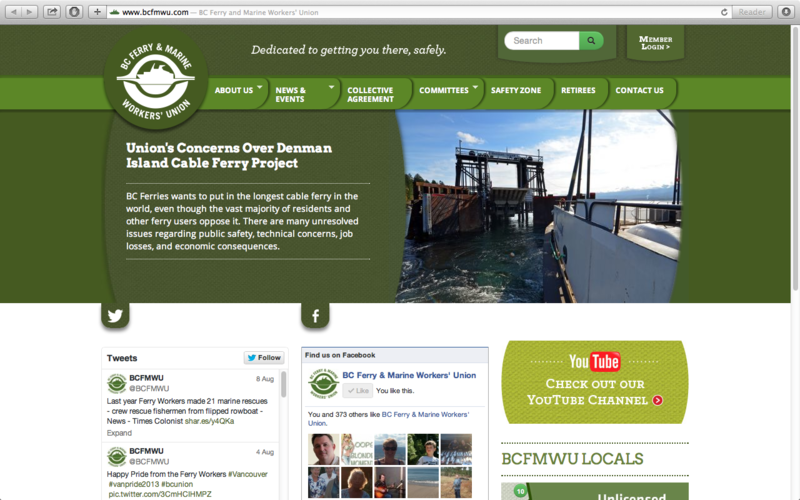 The BC Ferry and Marine Workers’ Union had been using a website that was set up and updated by volunteers. The site had a members section, and members were engaged, but the content of the site had grown to a point where it was unwieldy. The new union leadership brought in Foley Design Studio and we were able to review the entire site, keep what was useful and ditch the rest. As a result, they now have a site that looks great, engages the membership, and places a priority on getting important information to members as well as informing the general public about the activities of the union. We also implemented a secure members area where members can see information tailored for them. The members area also interacts with the unions membership database so that members can view and update their contact information and preference. We also set up an interactive online chat so that the union can engage their members in real time during scheduled Q&A sessions on the website. Our website needed a major overhaul, and we weren't sure where to begin. Foley and his team provided creative design and innovative solutions for all of our online communication needs. We now have a new website that our members can be proud of. And did we mention we're awesome to work with? Foley Design Studio designs and maintains union websites. We're members of Unifor 2040. We need... - None -…some more information…to get in touch to discuss a project.…a campaign site built right away!